Students with special needs often have difficulty recognizing emotions. It can be equally difficult for these students to identify their own feelings and also the feelings of others. One of the major fallouts of these challenges can be picking up on social cues. 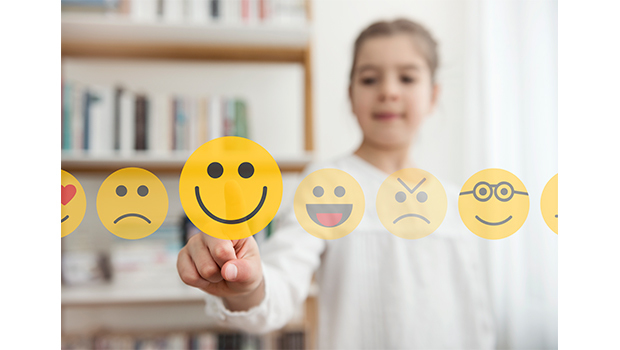 Teaching students with special needs to not only identify emotions and facial expressions but the associated feelings and scenarios that go along with that can help our students fit in better and have more successful social lives. One of the first steps is being able to identify how people are feeling by looking at faces. Using both pictures and videos of people feeling different ways is a great activity to do with kids. It can be fun, but more importantly a social-emotional learning experience. Here’s a sample lesson: Show a picture of an “easy” expression first like being happy, to the students. Ask each of the students to make a happy face, modeling it yourself as well. Help all of the students who are having trouble by pushing up the sides of your mouth to make a happy face and have them try this as well. Have a large enough mirror available so the students can look at themselves making a happy face and chant together, “We are all HAPPY!” Next, try making a sad face and repeat all of the same steps. Now that you have two emotions, talk a little about what makes you happy then make a happy face and ask the students to do the same. Ask the students to tell you things that make THEM happy and have everyone make a happy face. Repeat that activity with the opposite emotion. Each day, add two more emotions until you have a nice group of emotions to play with. Use videos to also show emotions and pause the video to ask the students to identify the emotion and then demonstrate to you their faces for that particular emotion. Make a Kahoot to guess the correct emotion (you could use this as a pre and post-test for a formative assessment). Give the students blank circles and have them draw faces with different emotions. Use materials such as: How Are You Feeling Today? Banner, Emotion Stones, Emotions And Feelings 6-Book Set as additional activities. Use a Peer Buddy situation to help the students see others with the emotions. Peer Buddies are non-disabled peers. Use these other resources to help students determine emotion. Finally, jump on those teachable moments. When an event happens naturally in class, challenge a student (especially those who have more difficulty with this skill) to identify the emotion they feel or another student is feeling “in the moment”. Once you have established the direct teaching of using pictures, you MUST teach in real-life situations for our students with special needs to use those skills in the real world; don’t stay in your classroom bubble! For example, a student drops her books in the hallway and a bunch of kids laugh at her. Ask a student to first identify how the girl is feeling and then what could you do and say to that girl? This may be obvious to us, but it may not be so obvious to the student with special needs. “She is embarrassed, maybe even sad. I could help her pick up her books and tell her a funny joke to make her happy again.” Bam! The real-life use of emotions knowledge that just helped this student with special needs make a friend! What are some other ways that you teach emotional recognition to your students?